A Warm, Vintage Cinnamon wood finish proves to be the perfect way to highlight the natural grain of the wood on this table's matched white oak veneer top. Finishing this piece is a unique, slatted pedestal base with large dark nailheads to add a rich, rustic industrial touch. Cushioned chairs provide the soft touch in a complementing gray fabric. 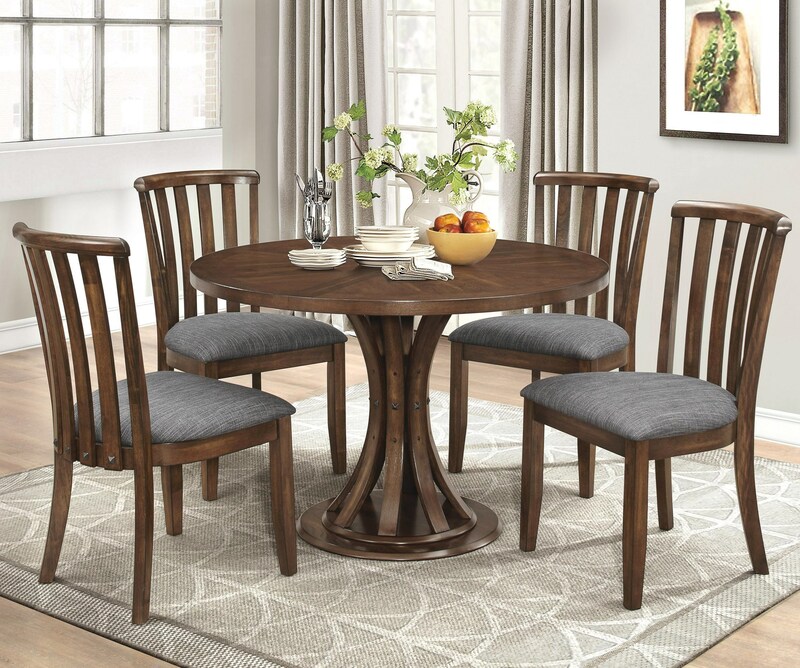 The Prescott Five Piece Casual Dining Set by Coaster at Value City Furniture in the New Jersey, NJ, Staten Island, Hoboken area. Product availability may vary. Contact us for the most current availability on this product. 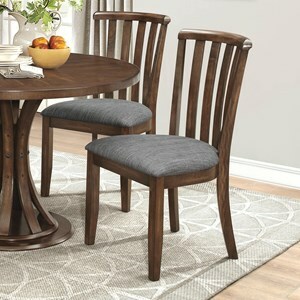 A dynamic modern design with sleek wood slats and large, nailhead stud detailing, this sculptural and pleasing dining set is a must-have. This small-scale dining table and chair set spans design styles gracefully, borrowing inspiration from Scandinavian Modern, Rustic Industrial, and Mission styles. Cushioned chairs in gray fabric finish this collection with a comfortable flourish. The Prescott collection is a great option if you are looking for Rustic Industrial furniture in the New Jersey, NJ, Staten Island, Hoboken area. 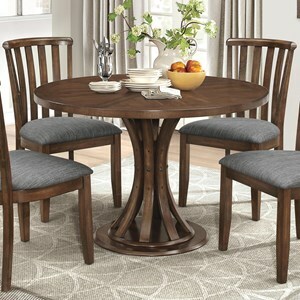 Browse other items in the Prescott collection from Value City Furniture in the New Jersey, NJ, Staten Island, Hoboken area.